Christmas, also known as midwinter in some cultures, is an annual celebration most commonly celebrated in December 25th according to the Gregorian calendar, a day Christians remember Jesus’ sacrifice. As a public holiday in almost all states across the world, it is celebrated by many, by Christians as a sacred day and by non-Christians as a cultural celebration of spreading love and the festive spirit. As a country with a significant amount of Orthodox Christian believers, Christmas is held in high importance in Russia nowadays. However, as history shows us, it is clear that it wasn’t always that way. For a holiday that is highly regarded, Christmas certainly went through a lot. Rituals for Christmas was already established around the 4th to 5th century. 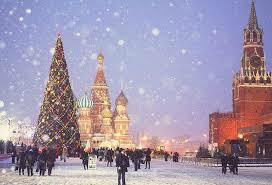 Early on, Christmas was celebrated as a holiday that is looked forward by the Orthodox Christian believers. People fasted on fish several weeks before Christmas, buy a fir tree (a symbol of life) and decorate their home three days before Christmas, and finally feast on pork on the day of Christmas celebration. After the revolution and the rise of Communist Era, everything changed due to the encouragement of atheism by the Soviet Union. Christmas celebrations were suppressed, the state banned Christmas in 1917, and Christmas trees were banned as well, until 1935 where the state attempts to assimilate the holiday by creating an emphasis to New Year instead. The assimilation attempt involve adopting the Christmas trees and turn them into “New Year” trees and adopting the gifting aspect, essentially making it partially Christmas but with another name. As a consequence, people who want to celebrate Christmas must do so in the new year or disguise their Christmas celebration as preparation for new year. Almost 80 years later, the communist Soviet Union fell. People came back to their religion, adopted the Julian calendar to mark their religious holidays, and in turn people were allowed to celebrate Christmas again. However, a separation between Christmas and New Year was made due to this, with the former seen as a religious holiday that should be celebrated privately by oneself or with family, and the later seen as a holiday where one can be festive, good food and drinks, and spend a lot of money. In the revived Christmas, it is a tradition for some people to fast until the first star appeared in the sky, after which people started eating a porridge made from wheat and mixed with honey, poppy seeds, raisins, chopped walnuts, and fruit trees called ‘sochivo‘. Honey and poppy seeds is said to ensure happiness, prosperity, and deep untroubled rest. Some Orthodox Christians avoid all kinds of meat on the day of Christmas. Others throw a spoon of their ‘sochivo‘ to the celling, which symbolize good luck and bountiful harvest if it manages to stick on the celling. Some children even go around singing, a tradition that carries over from Paganism. This highly important holiday has several folklores and stories associated with it, with two of the most common ones being the Grandfather Frost and the highly debated Babushka. The first one about Grandfather Frost and his Grandchild, Snegurochka. Grandfather Frost is adopted from the figure of St. Nicholas, and shares many elements with the well-known Santa Claus. Grandfather Frost is most commonly depicted as an old man holding a big magical staff nad known in Russia as Ded Maroz. Children would gather around the tree and call for Frost or his Grandchild, and it is said that when the star and the lights adorning the tree lights up, it is a sign of Frost or his Grandchild’s presence. The story of Babushka is floating in some circles, but some never heard the story and others claim that the story is actually fiction created by the American writer Edith Matilda Thomas in 1907. Nevertheless, the story talks about Babushka (meaning “Grandmother” in Russian. Check out 150 Basic Russian Words for more basic vocabulary) who is always busy cleaning. Three men, implied to be the three kings who took a long journey to see baby Jesus, stopped and spent the night at her home, asking Babushka to come with them and bring gifts. One king brought gold, and the other two brought spices and perfumes. In spite of the three kings’ insistence, Babushka did not come to see baby Jesus, and when she decided that she wants to come, after all, she missed the moment and baby Jesus has left. It is said that Babushka is still looking for him. Nowadays, different to the rest of the world, the holiday is celebrated in January 7th, December 25th according to the calculation of Gregorian calendar. The tradition is, as mentioned above, fast until the first star appeared in the sky, feast for three hours, then go to the church for a service until midnight, leaving the dishes unwashed until the next day. Due to the abundance of Orthodox Christian believers, Christmas is one of the most important holidays, and it shows through the integration of parts of older traditions such as Paganism and local myths. In spite of the Communist reign’s attempts to stomp out religious celebrations and the loss of certain traditions due to almost 80 years of religious celebration ban, the country managed to revive the tradition and do it again even if it is a modified version. For more articles about Russian culture and its history, please visit The History of Russian Banya, International Woman’s Day in Russia, The History of Russian Samovar, and the History of Matryoshka Nesting Dolls.